Our Orange Frosted Shopper is one of our fastest consolidated bags, especially in the month of October. Our orange frosted shoppers are a hit with businesses that want to change up their packaging during Halloween. It is also a good option for business sponsoring a Halloween event. Now showing the options for "3 Mil" and "1 Color - Flexograph Print"
Our Orange Frosted Shopper will make your store a hit with small children. You can use the bag to pack things up. 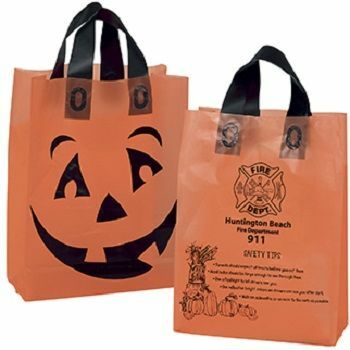 Since it is a Halloween bag, parents and kids will be likely to save the bag to use on Halloween. If customers want more Halloween bags, you can sell them at an additional cost, thus making profit of our high quality courier bags. You can also pass them out on the street to parents and kids as part of your marketing strategy. If you are hosting a grand Halloween party, you can place goodies in the bag to give them out at the end of the party.